If you are on a gluten-free diet, one thing you may miss is indulging in a delicious chocolate cupcake. 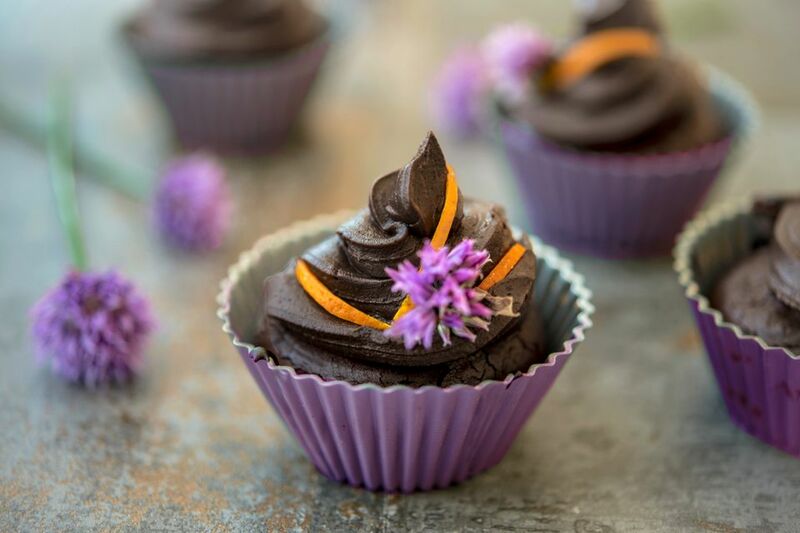 Well, worry no more, these flourless chocolate and orange cupcakes will fit your diet perfectly, as they are gluten-free. And, even if you can eat gluten, you will still love these moist little cakes with their soft fudge-like center. Make the cakes ahead of time too, as they freeze really well. Just make sure that you decorate them with frosting and the like after you have thaw them from the freezer. The frosting will not hold well in the freezer. That being said, when it comes to decorating, let your imagination run wild! Cupcakes give you the opportunity to be as creative as you like, piling on the frosting and sprinkles any way you like. Place the chopped chocolate and the cubed butter into a heatproof bowl. Place over a saucepan of simmering (not boiling) water and leave the chocolate and butter to melt. Resist any temptation to stir or the chocolate may seize, and you will not be able to use it. Once melted, stir the chocolate and butter together with a wooden spoon. Remove from the heat and leave to stand for 10 minutes in order to cool slightly. Once cooled, whisk in the brown sugar and salt and keep whisking until the sugar has melted. Finally, add the beaten eggs, a little at a time, continuously whisking until you have created a smooth batter. Finally, add the orange extract and zest and whisk again. Sift in the cocoa powder and fold gently into the batter with a metal spoon or rubber spatula. Place a cupcake liner into each cup of a muffin tin and fill each 3/4 of the way full. Place in the center of the preheated oven and bake for 15 to 20 minutes, or until the cakes are firm. If the surface cracks a little, do not worry, they will still taste good. Remove the cakes from the tin and place on a cooling rack and leave until completely cold. Beat the butter in a large bowl with a wooden spoon, until soft. Then beat in half of the sugar until smooth. Add the remaining sugar, then sift in the cocoa powder and beat again. If the mixture is too stiff, add a few drops of milk until you reach the consistency you like to decorate. Or, if you are in a bit of hurry, use a hand mixer instead of the wooden spoon. Either pipe or spoon the frosting on to the cakes and decorate as you wish. The cakes will keep up to two days in an airtight box. If you want to freeze cupcakes, do this before frosting. Defrost in the refrigerator and then decorate as you normally would.